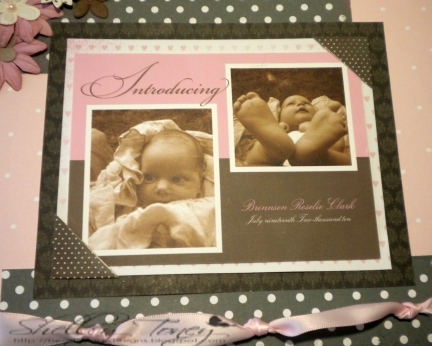 On this cold and foggy Saturday morning I took some time to sit down in my craft room and create this beautiful scrapbook page. I am not usually very boastful about my scrappin' abilities but today I am very proud and pleased with what I was able to create. This is a photo of my beautiful grandbaby, Brinnsen. This photo was taken when she was only a couple months old by her parents and I think it is lovely. They then turned it into thank you card/announcement cards to hand out to family and friends. Since there is a handwritten message on the back of the card I knew I didn't want to tape the photo down so had been debating the best way to show it off in an album without ruining that treasured message. I decided to use the polka-dot corners from Kaiser Craft to mount the photo card and I think it worked perfectly! Let me share with you the supplies I used. 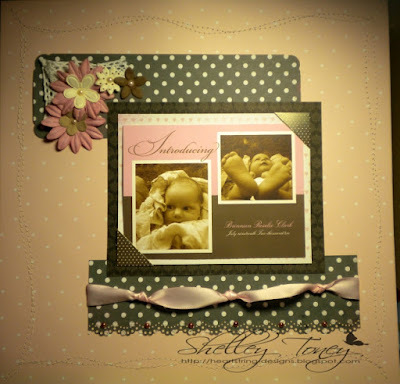 Anne from Paper Patch Crafts supplied the beautiful papers and prima flowers. The papers are Kaiser Craft After Five. I think they are very elegant, don't you? The pink background paper was some I already had on hand, but I think it worked beautifully with the Kaiser Craft papers. I used my sewing machine to stitch around the outside edges of the page to help to draw the eye back into the story going on at the center of the page. I hope you enjoy this page. Please let me know what you think! Well I love it! Though I suppose I could be a little partial since I am her mother! Looks great Shelley! Absolutely lovely! What a cutie-pie! this is a gorgeous layout!!! love it!! YOu are right- it's beautiful!! You did an amazing job!! It is beautiful! !